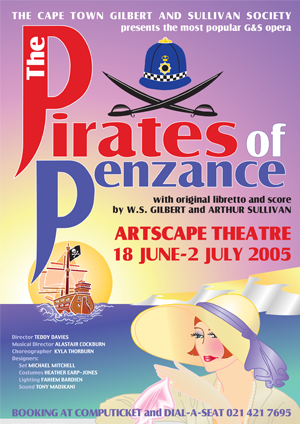 The Pirates of Penzance; or, The Slave of Duty is a comic opera in two acts, with music by Arthur Sullivan and libretto by W. S. Gilbert. The opera’s official premiere was at the Fifth Avenue Theatre in New York City on 31 December 1879, where the show was well received by both audiences and critics. Its London debut was on 3 April 1880, at the Opera Comique, where it ran for a very successful 363 performances, having already been playing successfully for over three months in New York. The story concerns Frederic, who, having completed his 21st year, is released from his apprenticeship to a band of tender-hearted pirates. He meets Mabel, the daughter of Major-General Stanley, and the two young people fall instantly in love. Frederic finds out, however, that he was born on 29 February, and so, technically, he only has a birthday each leap year. His apprenticeship indentures state that he remains apprenticed to the pirates until his 21st birthday, and so he must serve for another 63 years. Bound by his own sense of duty, Frederic’s only solace is that Mabel agrees to wait for him faithfully. Pirates was the fifth Gilbert and Sullivan collaboration and introduced the much-parodied Major-General’s Song. The opera was performed for a century by the D’Oyly Carte Opera Company in Britain and many other opera companies and repertory companies worldwide. It has received several modernised productions, including Joseph Papp’s 1981 production on Broadway, which ran for 787 performances, winning the Tony Award for Best Revival and the Drama Desk Award for Outstanding Musical, and spawned many imitations. Pirates remains popular today, taking its place along with The Mikado and H.M.S. Pinafore as one of the most frequently played Gilbert and Sullivan operas.